BUCYRUS – Bucyrus City Schools recently brought a piece of history back to life with the re-dedication of the historic bell that once sat atop the Union School. Since the re-dedication, the district has given current students and staff, alumni, retired staff and community members the opportunity to leave their legacy on the Redmen Walk. The fifth-grade team at Bucyrus Elementary School had been searching for a way that their current students could leave their legacy atthe school. Originally, students set a goal to collect enough change to purchase a $50 paver. 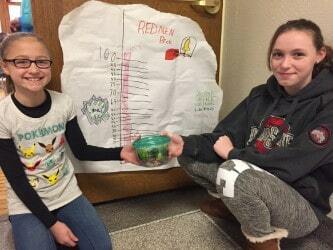 By the end of the week of January 23, the students had collected enough change to purchase a $100 brick on the Redmen Walk. While students have yet to decide what will be engraved on their brick, they are excited to see their paver and visit it for many years to come. Orders are still being accepted through March 15, 2017. Orders can be placed online at http://bucyrusschools.org/community/redmen_walk, or by visiting one of the buildings in the district. Those purchasing a paver will receive a certificate of purchase. For more information about the “Redmen Walk”, please visit the school district website or call the Lincoln Administrative Center at 419-562-4045.